The fact that there is not a single witness to the creation of the Marree Man speaks to the absolute isolation of central South Australia. 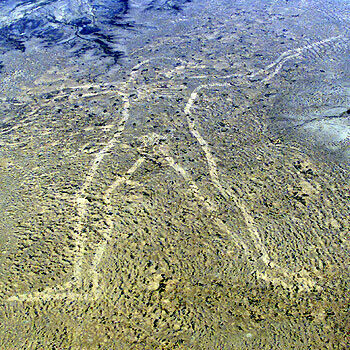 Somehow in 1998, one person or a group of people were able to create a 2.6-mile long line drawing of an aboriginal hunter, without being seen or spilling the beans themselves. A dinosaur stampede frozen in time. 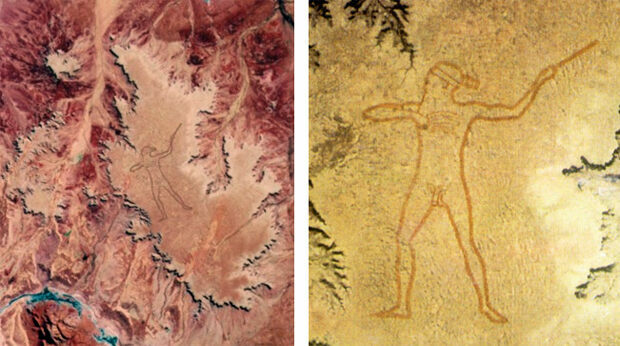 In the midst of barren, arid land in South Australia, the Marree Man is the largest geoglyph and work of art in the world. 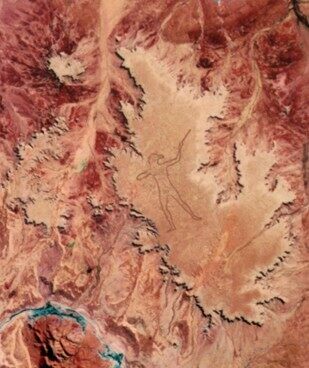 Cut into the harsh landscape with lines over 115 feet wide and one foot deep, the towering Marree Man is easily visible from space. 13 years after the Marree Man was discovered during a flyover, little is known about its origin that does not seem to lead to a dead end. Despite the lack of conclusive proof of its creator, most of the clues seem to lead to the conclusion that Americans produced the giant. Yet nothing in the case of the Marree Man is that cut and dry. Immediately after the drawing was found, a number of anonymous press releases appeared by the supposed creators. 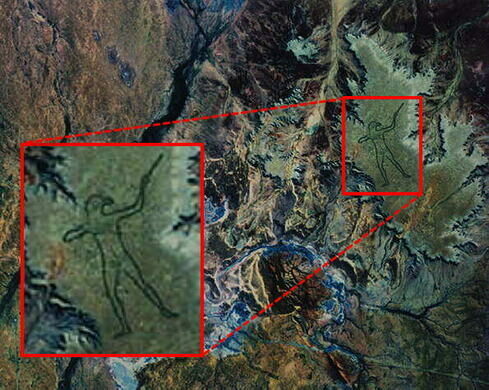 Judging from the releases, most people began to believe that the Marree Man was created by Americans especially because of descriptions of the Man written in feet instead of meters, and references to aboriginal “reservations,” a term not typically applied to aborigines. Despite these clues, many others believed they were released simply to throw investigators off the case. More information emerged in 1999 when a plaque was discovered, thanks to an anonymous fax, near the Marree Man’s head. The plaque features an American flag, Olympic rings, and a quote from a book about aboriginal hunting, but offers no other solid evidence pointing toward a creator. The final strange set of clues were a few man-made objects found in a pit near the site. They included a jar with an American flag, a satellite photo of the figure and a bizarre reference to the Branch Davidian religious sect. Despite evidence leaning toward American authorship, others have proposed that the Marree Man is the creation of an Australian artist who died in 2002. Although we may never know the true origin of the Marree Man, it is certainly one of most intriguing modern-day mysteries. The site is not accessible to the public, but flyovers across the area are permitted. Due to environmental changes and little maintenance, it had almost completely disappeared until locals made efforts to restore it using a grader in 2016. Past Blinman, past the end of the asphalt, in the majesty of the Flinders Ranges, on the Sheep Station of Oratunga, you will come upon three stone markers by the road.